While everyone loves the idea of spoiling their friends and family with lavish gifts during the holidays, the reality is that most consumers need to seek out deals, sales, and discounts to help fill their stockings. As part of the POPSUGAR Insights 2017 Holiday Report, we asked 3,000 US women to tell us the impact that discounts have on their holiday purchasing plans. Overall, one in three millennial women say that sales, deals, and discounts have a great impact on the total amount they spend on apparel and accessory gifts. This is important because over one in two millennial women plan to spend over $100 on apparel purchases this holiday season, and overall, 81% expect to spend more or about the same on apparel this year compared to last year. 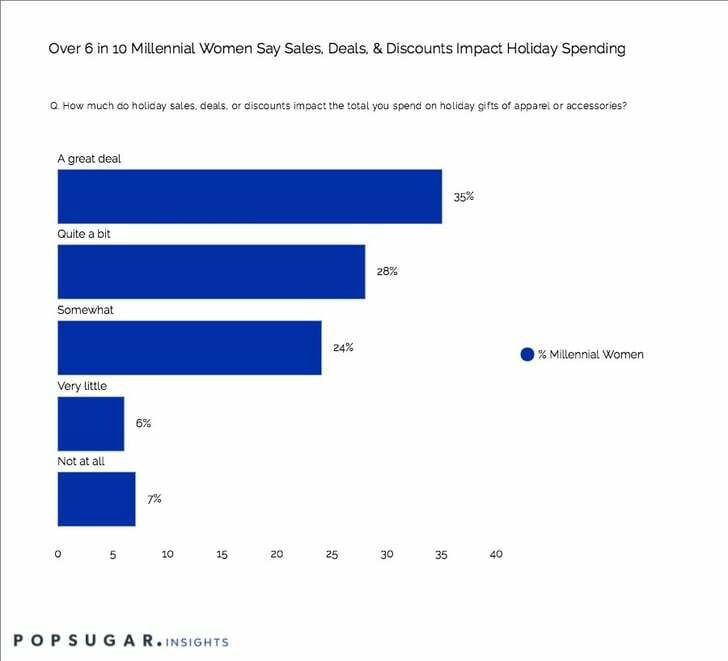 Breaking it down further, millennial women say that sales, deals, and discounts impact the total amount they spend on holiday apparel and accessory gifts they purchase "a great deal" (35%) or "quite a bit" (28%). Only 14% say that sales, deals, and discounts impact their shopping "very little" or "not at all."